So far all the read operations performed in the atomic block were being recorded, so as to be re-executed at commit time. We will see in this post that there are circumstances where one does not want the reads to be recorded. I will call these silent reads. 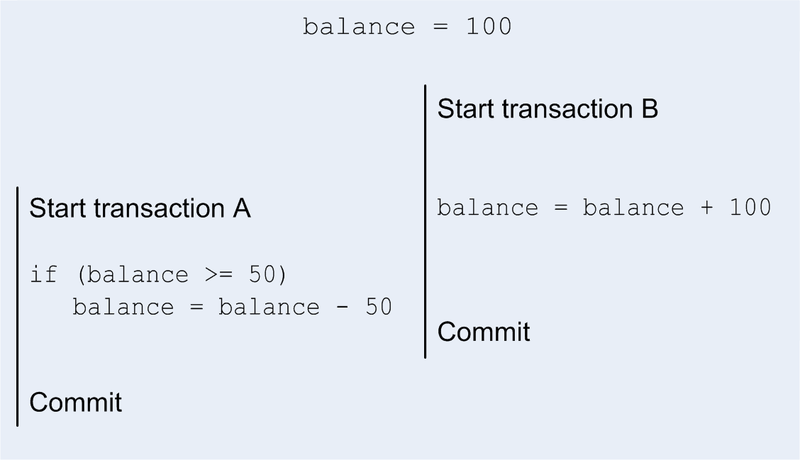 In this post I will introduce software transactions with semi-mutable versioned variables. Transactions have been around for a long time. They are typically associated with databases, but also commonly used in other areas such as source control systems and installers. Database transactions are the inspiration of memory transactions, either with hardware support or as software transactional memory. Every transactional system has its own variation; however they all share the fundamental concept of atomicity and provide some level of isolation. Transactions allow the concurrent execution of multiple execution threads while preserving the illusion of serial execution within each thread and preserving consistency. Transactional systems tend to suffer from spurious conflicts which unnecessary fail transactions. These spurious conflicts are conflicts which have no valid semantic or logical origin. We will see how software transactions can help reduce or sometimes entirely remove these spurious conflicts.